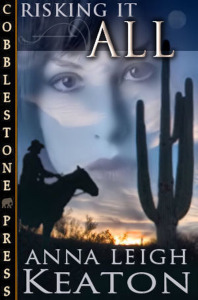 Running from London, England, her overbearing father, and an arranged marriage, Neela Singh seeks shelter on Travis Kincaid’s ranch in Arizona. The cowboy is even bigger and sexier than the man she remembered-and loved-from her youth. Now if he could only see her for the woman she is, not who he believes her to be. Travis can’t keep his eyes-or hands-off of Neela. As much as he detests her pampered princess’ upbringing, there’s something sweet about her that draws him. And once he’s tasted her, there’s no stopping his desire for her. A trickle of sweat ran down the center of her back. Her forehead beaded with it. Arizona in mid July was hot and dry and all around miserable. Funny, Neela thought as she swiped her sleeve over her face, when she’d been here as a sixteen-year-old she’d loved the heat. Loved everything about Arizona. Especially the Kincaid brothers. Now she was here out of necessity. To get away from her father. To hide out like an outlaw until he gave up his outrageous idea of marrying her off to that hideous old man. She sighed and watched three little boys run around the small lawn between the house and the dusty driveway. For the next few weeks they were her responsibility. Aaron was six, Bobby four, and little Christopher only three. Cute kids. They looked like three miniature versions of their father, Travis Kincaid. Would he remember her? she wondered. More than a decade had gone by since she’d seen Travis. Twelve years since she’d thrown herself at the devastatingly handsome man and professed her undying love to him. Her face burned with remembered embarrassment at how he’d looked at her. His Caribbean blue eyes sparkling with humor and tenderness as he’d wrapped her in his arms, kissed her cheek, and told her how flattered he was. But then he’d gone on to tell her that at twenty-eight he was too old for her, and that someday she’d meet a man who would make her forget all about him. An unladylike snort slipped out of her as she lifted the icy glass of lemonade to her neck and let the cool condensation trickle down to her collar. In the years between then and now, she’d survived a lot of heartache and physical pain, had even been engaged to a man she’d thought she loved with all her heart. Always, though, in the back of her mind, lived her first love. The first man who’d made her feel like a woman, even though at sixteen she’d been little more than a child. Even though to him she’d been nothing more than a cute kid who followed him around the ranch like a love-struck puppy. Now here she was, older and much wiser, back on Rocking K, waiting anxiously for a glimpse of Travis. Tingly and excited that he might remember her. Terrified that he wouldn’t. The joyous chorus of childish laughter made her smile as Bobby and Aaron chased a lizard through the grass. Christopher, the little gopher, sat covered in dust, digging pothole after pothole in the drive. Travis had married the woman he’d been dating way back then, and they’d had these three cute boys. But his wife was gone. And from what her cousin, Carol—who married Travis’ brother, Jeff—had told her, his wife’s death had had a strong impact on him. He’d become a loner, a recluse of sorts. A far cry from the fun-loving jokester and flirty sweetheart he’d once been. Carol said his only concerns now were his boys, the cattle, and the land. In that order. A pickup came over a rise in the road, a tail of dust arching over the alfalfa fields in its wake. All three boys squealed and ran for the porch where they took up positions on the steps to await the vehicle. “Daddy!” Bobby shouted, waving frantically at the truck as it pulled into the yard with a small, single-horse trailer in tow. Neela’s heartbeat went into overdrive. Her body tingled in anticipation. Her belly fluttered as if she were still an infatuated schoolgirl, but she couldn’t help it. He’d been her hero, her fantasy, for as long as she could remember. She rose from the rocking chair and stood behind the boys. Aaron turned and grinned at her, his chubby cheeks smeared with dirt. She smiled back, but her mind was on only one thing. Gravel crunched as the truck stopped in front of the house. The engine’s rumble died. The driver’s door swung open and out stepped…Travis.